Maple bourbon cranberry sauce is the perfect addition to Thanksgiving dinner. Equally sweet and tart, it will make you never want to buy canned sauce again! I…. am still on a Thanksgiving kick. Last week I shared my fabulous recipe for gorgonzola green bean casserole. It has been a hit on Foodgawker and Tastespotting – which put me even more in the Thanksgiving mood. I even went out and bought a turkey today. Boo yah. While the turkey is defrosting I thought I would share with you another fun Thanksgiving recipe. 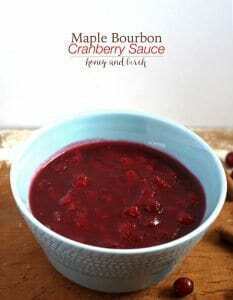 Maple syrup meets bourbon, they get married and make a cranberry sauce baby. Something tells me I have already gotten into the bourbon. I used to be a canned cranberry sauce girl. 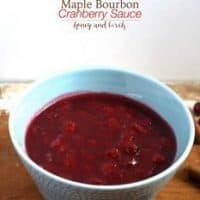 Then last year I rounded up a bunch of awesome Thanksgiving cranberry sauce recipes and I became part of the homemade cranberry sauce fan club. It’s a thing. I swear. I’m on the appetizer team for Thanksgiving this year, but I am going to send this recipe over to the sides team in the hopes it gets made. Cross your fingers for me that it happens. 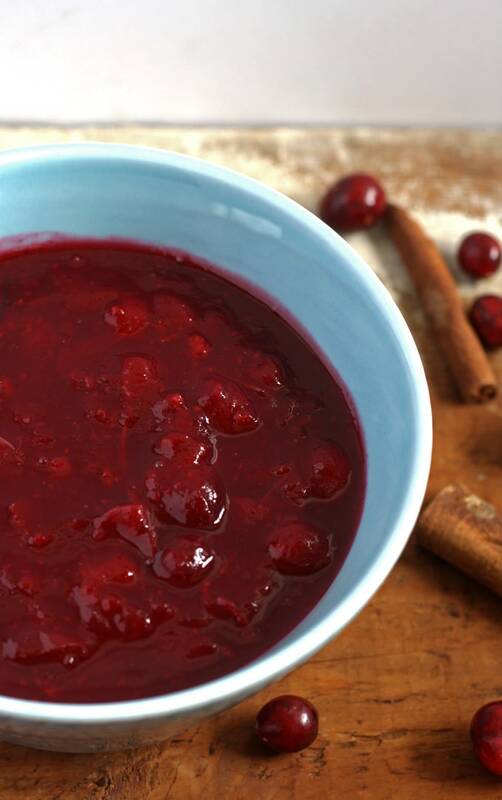 The key to this maple bourbon cranberry sauce recipe is the slow simmer. 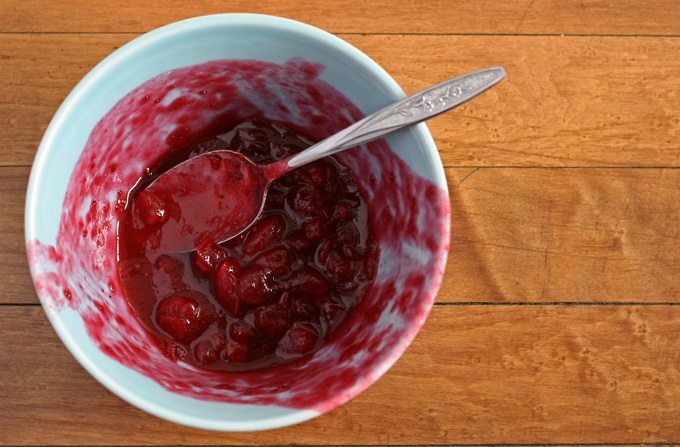 Bringing the liquid to a boil gets the heat up high and the cranberries poppin’ – the next step is building the flavor and thickening the sauce. A little cornstarch helps but letting it sit for a little bit before serving is key. I like to eat it when its still hot, but it’s also yummy when cool. Also, the sauce is on the sweet side. If you are a fan of tart sauces, reduce the maple syrup and brown sugar by half. The sweetness will still be there, but it will be more subtle. Rinse the cranberries. Combine the cranberries, bourbon and water in a medium saucepan. Heat over medium-high heat and bring to a boil. Reduce heat to a simmer and add the maple syrup, brown sugar and cinnamon. Stir well and simmer for 20 minutes. If the liquid is splashing out of the pot, cover partially. Add the cornstarch and kosher salt. Top with a splash of bourbon before serving. I hope you are all enjoying my Thanksgiving enthusiasm. I’m on a Thanksgiving kick too! I have always had the idea to make homemade cranberry sauce but not yet the opportunity – this will definitely be the one when the time comes! It was one of those recipes on my recipe bucket list that I had to conquer – I’m sure you have that list too. Have a happy Thanksgiving! 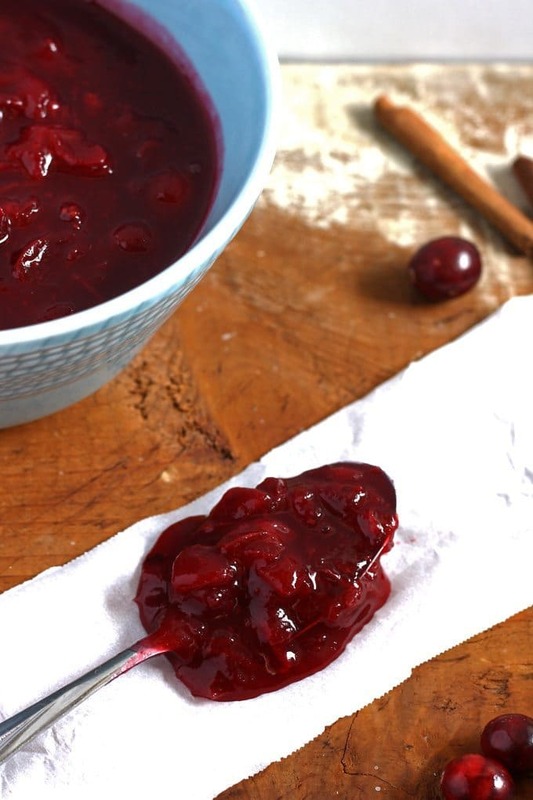 There is nothing like homemade cranberry sauce…I don’t know how anyone can eat the stuff out of a can! This looks so good! I need to try it! Pinning! Thanks Michelle – I used to swear by the canned stuff, and then I tried my cousin’s homemade cranberry sauce last year. I was a changed woman. 🙂 Have a great weekend! I wanted a cranberry cheesecake topping that was sweet and not too tart. This came out EXACTLY as I hoped!! It’s delicious! Thanks so much for sharing this recipe!! Thank you Eve for circling back to leave your comment! I appreciate it.